Various signwritten Bedford CA vans, plus minibus & camper variants. Homepage. This page: Classic Bedford CAs, featuring attractive signwriting to their coachwork, plus caravanettes & minibus. 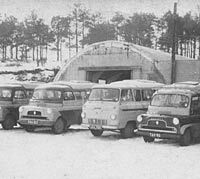 Bedford CA Vans in use in the 1950s. 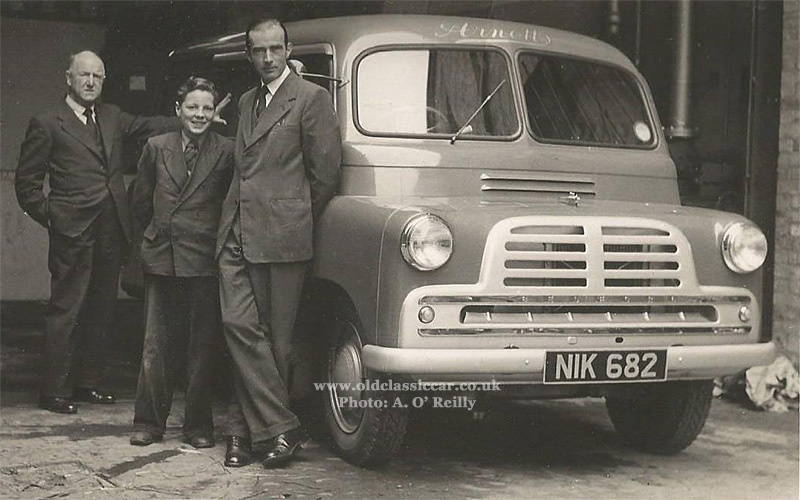 Les has delved into his albums once more, and turned up the first two old photos for this page, both showing classic Bedford CA panel vans, early versions with the removable rear wheel spats. Thanks for sending them over! 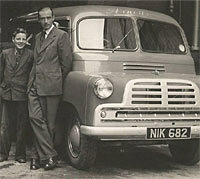 Les is no stranger to Bedford CAs either, this CA van photo shows Les and some friends. They formed a pop group in the early 1960s called The Concords, and used their CA van to carry the band's equipment. Now, back to the two van photos that open this page.. 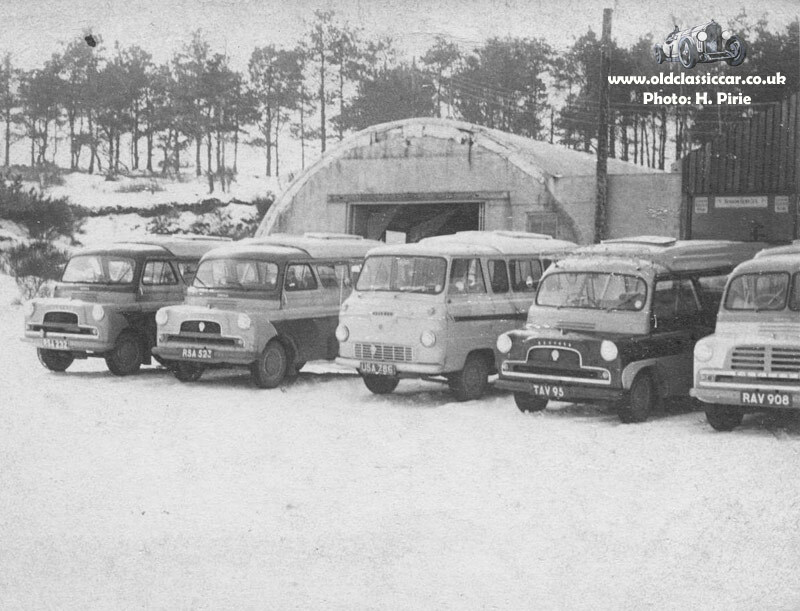 The first CA Bedford is seen in very snowy conditions. 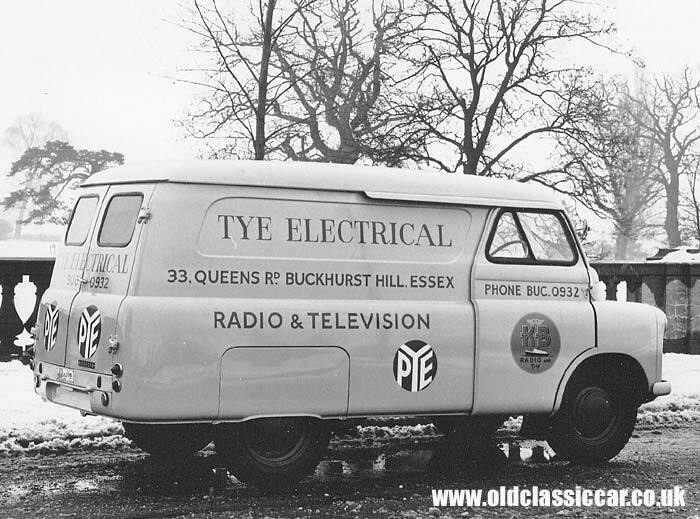 Apparently unregistered, my hunch is that this photo was taken shortly after the fresh signwriting had been applied, and before the splitscreen van was delivered to Tye Electrical, of Queens Road, Buckhurst in Essex. The company must have been agents for PYE radios and televisions, judging by the signwriting, and also K-B. Radiograms were also all the rage in the 50s and 60s, so no doubt the van would have carried a few of those huge home sound systems during it's life on the road. 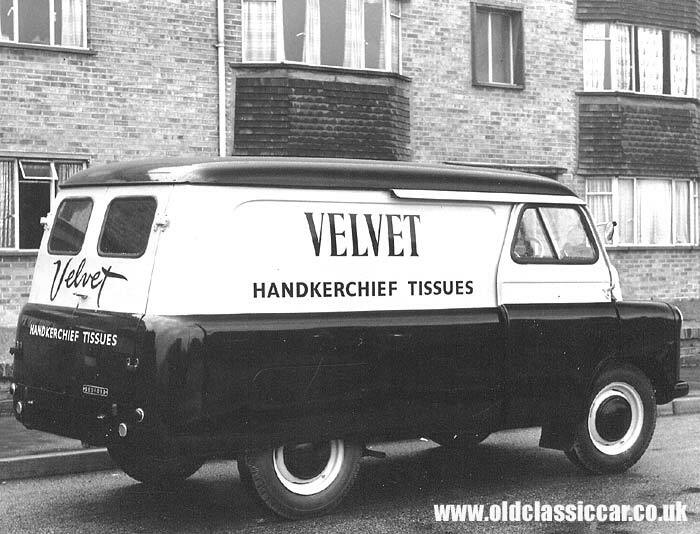 The second CA van has signwriting for "Velvet Handkerchief Tissues" tastefully applied to the body sides and also the back doors. Once again an un-registered Bedford CA, so probably a picture taken by the signwriters themselves, prior to delivery. Two more signwritten CA vans appear on this page, at least one of which again is advertising a radio & electricals shop. 3. Bedford CA Kenex minibus conversion. Next, a different variation on the Bedford CA theme, and again an image supplied by Les from his files. This shot shows a minibus version of the CA produced by Kenex. I've no more information on this type, other than that at one time these vehicles were known as Kenebrakes. Note the revised rear styling, courtesy of what look like fibreglass appendages, presumably intended to modernise the look and distance it from standard vans. 4. A Mk1 Bedford CAS van. 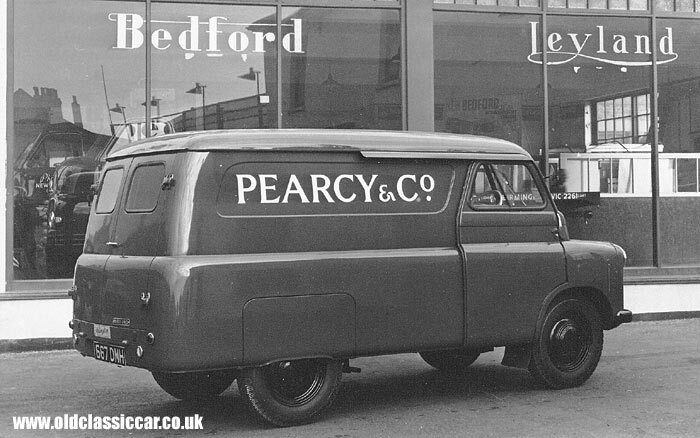 Another great old photograph of a Bedford CA van from Les, seen here in early, Mk1, CAS (for short wheelbase) guise. 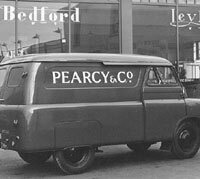 This new van is seen in the livery of Pearcy & Co., parked outside a Bedford and Leyland vehicle sales agency. Inside the dealership, to the left, are two S-Type Bedfords. Unusually for a CA, this example has semaphore indicators fitted within the front wings - not something I've noticed on a van before, in this position. Presumably this dealership was located in the Midlands, the rear flatbed body of one S-Type can just be seen in the window, behind the CA's cab, with the word "Birmingham" on it, plus some contact telephone details. 5. Line-up of Bedford CA caravanettes. 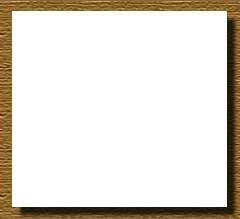 The next two photos were kindly sent over by Henry for inclusion on the site. They date to the winter of 1961/1962. 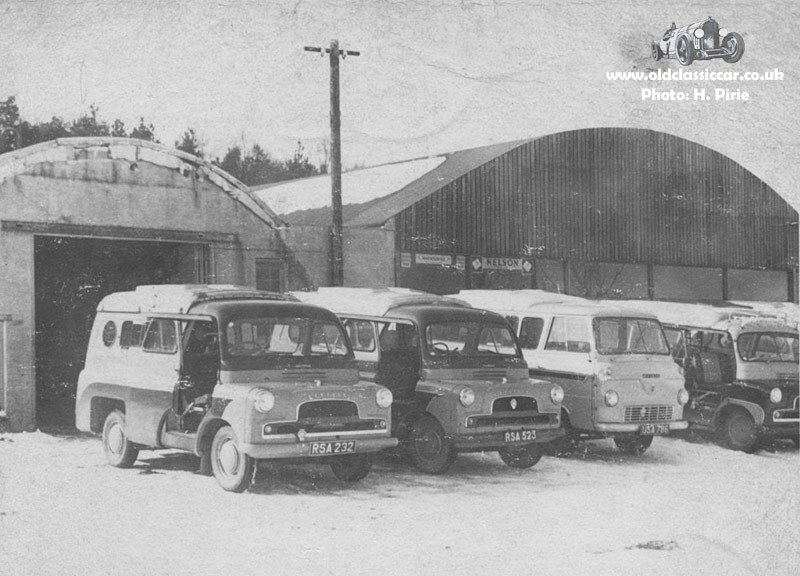 The classic campers are shown outside Arthur Watson's garage in Aberdeenshire, where caravanettes were available to hire on a self-drive basis. All but one of the vehicles lined up are Bedfords, with just one interloper - in the form of a Ford Thames 400E - joining the otherwise all-Bedford line-up. Four converted CAs can be seen in the two photographs, registered locally as RSA 232, RSA 523, TAV 95 (a Kenex conversion), and RAV 908, the latter being earlier than the others, because of its two-piece windscreen and different style of grille. Apart from TAV 95, the conversions were all undertaken by Dormobile. 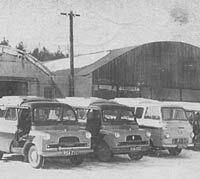 The garage had been in existence for some time by 1961/1962, having previously sold pre-war cars, and it was in '62 that the business re-located to Aberdeen itself, where Arthur Watson continued in business until his retirement in 1983. Henry also sent over a photo of a CA campervan that had been rolled, and had to be returned to base behind a Series 1 Land Rover recovery vehicle - the photo may be found on the Land Rover photos page, picture #2. Les has been back into his files, and sent over the next two Bedford photos. 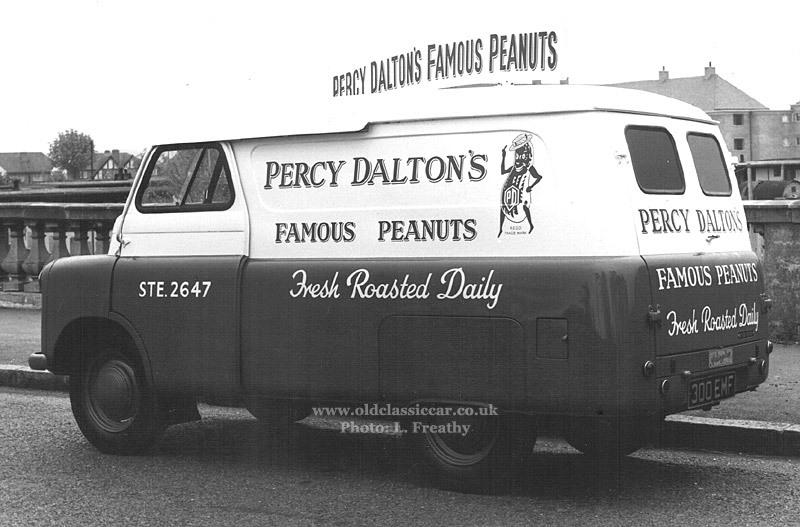 The first is of a short wheelbase van, in the livery of Percy Dalton's Peanuts. The van's registration is 300 EMF - a quick perusal of the MF section of the registration pages here on OCC (link), confirms that this London registration dates this split windscreen Mk1 CA to early/mid 1955. An extra badge reading "Arlington", can be seen affixed to the rear panel, above the numberplate - presumably the supplying dealership. 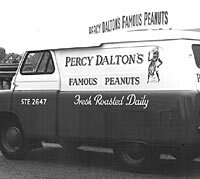 The aforementioned peanut company was established in the 1930s and continues in business to this day, now operating from the Haverhill Business Park. 7. Another split-screen CA, from 1954. 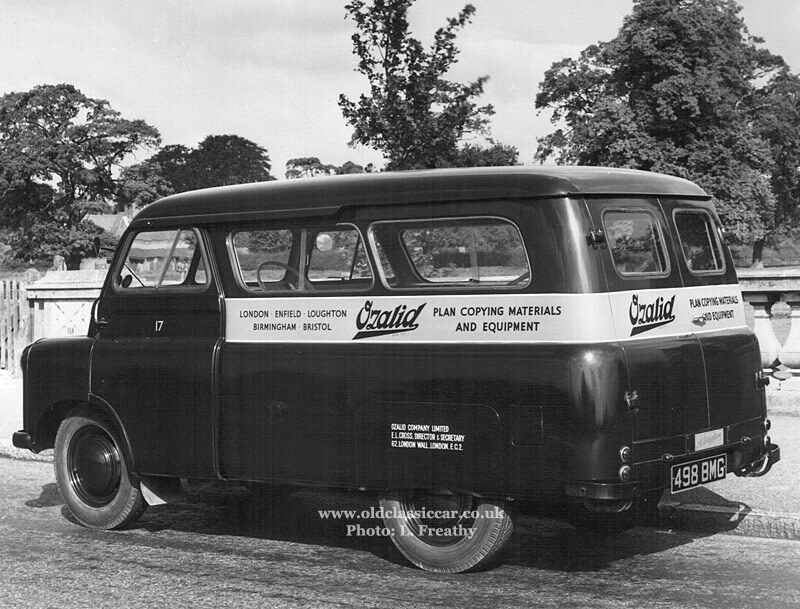 This van, belonging to the Ozalid copy equipment firm, is also a split-screen CA, registered 498 BMG (early/mid 1954) and again adorned by a plaque for "Arlington". Based on a van, this example has rear side windows so is perhaps configured as a minibus. Thanks for these latest additions Les. 8. 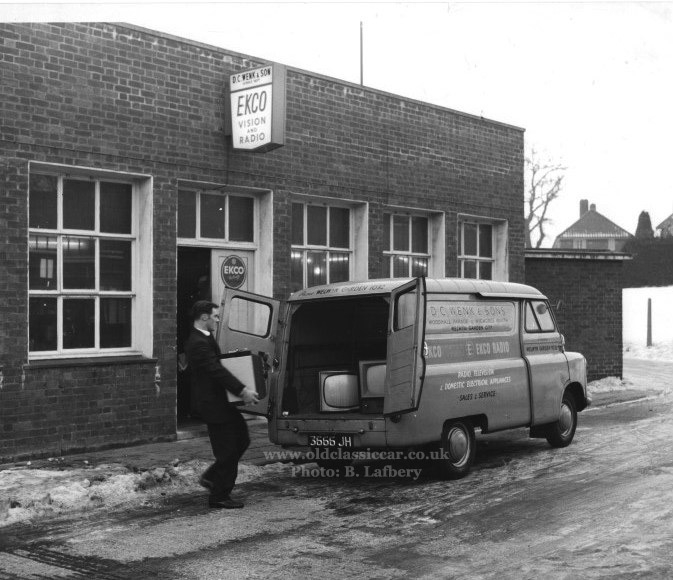 Ekco TV delivery van. 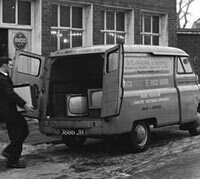 "After looking at your Bedford vans this morning, I thought you might like this one of me delivering TVs for D.C. Wenks' TV repair shop in Welwyn Garden City, Herts., in 1962. The photo was taken by Vauxhall Motors for advertising. I was having a break from being a mechanic and needed a clean job for a while. Feel free to put it on the site, I don't think Vauxhall Motors will mind after all this time." 9. A Dublin-registered Mk1 van. My thanks to Aidan now for this next excellent photo of a Bedford CA. He posted it onto the OCC Facebook page, hoping that the make, model and year of the van might be found. The split-window pointed to it being a Mk1 CA. The NIK registration series, issued in Dublin, first came into circulation in July of 1956. In 1959 the Mk2 CA was introduced with, amongst other detail changes, a one-piece curved windscreen, a response to complaints about blindspots with the earlier split-screen arrangement. Therefore the van below dates to 1956-1959. Aidan's dad, Joe O' Reilly, is stood to the right in this group shot. 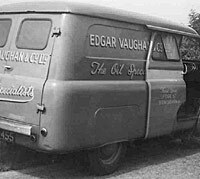 He joined Arnott's (a large department store in Dublin) back in 1928 and remained there for 50 years, he also painted the lettering on to the van. Thanks for the photo. 10. Rear 3/4 view of an early van. 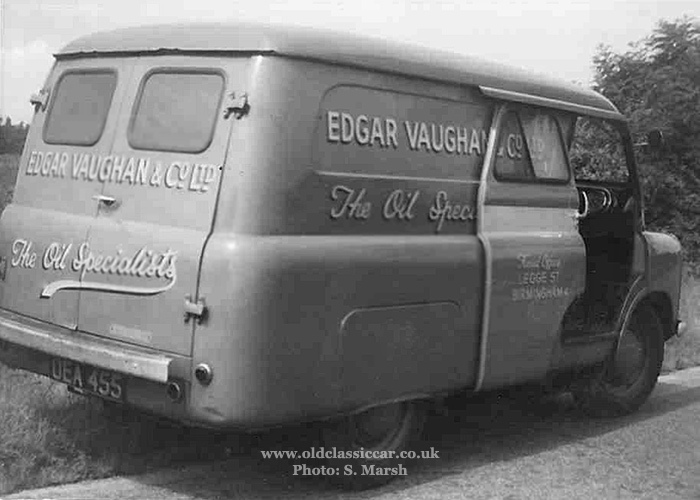 Next, a rear 3/4 view of a signwritten Mk1 CA van, in the livery of Edgar Vaughan & Co. Ltd (The Oil Specialists), who worked in and around Birmingham. The van was in reasonable condition at the time, rather than immaculate. The sliding side doors, a feature of the CA to aid delivery drivers doing regular repeated drop-offs, can be seen here in the open position. It wasn't unknown for the doors to slam shut under hard braking, or for them to slide off the rails altogether if opened in a hurried manner once wear had set in. A very interesting photo, thanks to Stuart for ok'ing its inclusion here. Background to the Bedford CA. 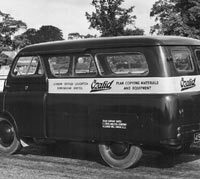 The 10/12cwt CA series of Bedford vans was launched in 1952, replacing the pre-war designed PC range. Priced at 400 GBP plus Purchase Tax, they proved popular from the outset. 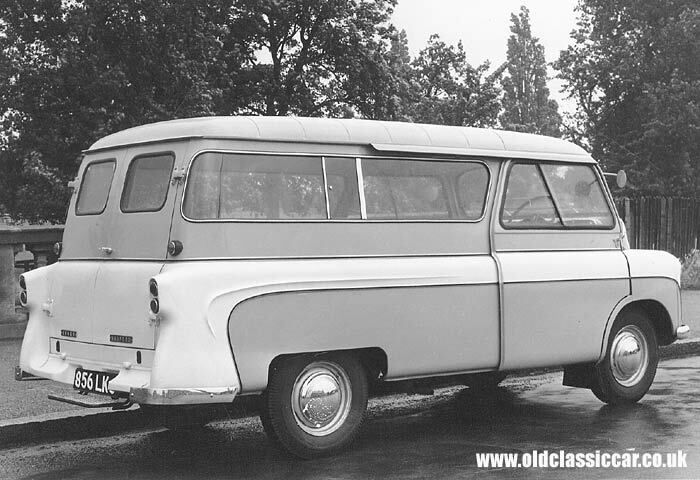 As well as the basic panel van, outside coachbuilders could opt for a chassis/cowl, or chassis/cab, version, onto which their own specialised bodies could be built. Best known are probably the legions of ice cream vans that were built using the CA's underpinnings. A smart pickup was offered by the Walker company, with hinged rather than sliding side doors. Walkers could also supply a tipper version of the CA Bedford, a very handy little workhorse popular with builders and market gardeners alike. Grosvenor produced a Canopy pick-up based on the CA van. Other variants would be produced by different coachbuilding firms, with gown vans and flat bed trucks all being built, using the CA's chassis & cab as a basis. The Mk1 CA Bedfords are immediately identifiable thanks to their split windscreen arrangement, a 'feature' that would disappear with future updates due to popular demand for improved driver visibility. Power came courtesy of the Vauxhall Wyvern E Series' four cylinder unit of 1507cc, coupled to a column gearchange, driving the rear wheels (16" rims fitted, replaced by 15" in 1957). Return to Old Vehicle Photos Page 7.